Following a recent hospital visit, the Aerosmith guitarist has elected to take the rest of the year off. 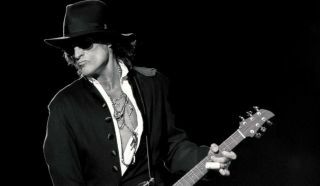 Joe Perry has canceled his fall American tour. The Aerosmith guitarist's publicist said that Perry has elected to take the rest of the year off, following a recent hospital visit. He had been scheduled to tour with a band featuring his Aerosmith co-guitarist Brad Whitford as well as Extreme vocalist Gary Cherone from November 30 through December 16. You can see the full list of cancelled dates below.